This day I got a group of us from Hawaiian Electric Co, got together and I tortured them through 5 hours while I practiced my Nature Conservancy hike talk on them. Our destination was Palikea, the broad peak on the left side of the Waianae range as you come from town. 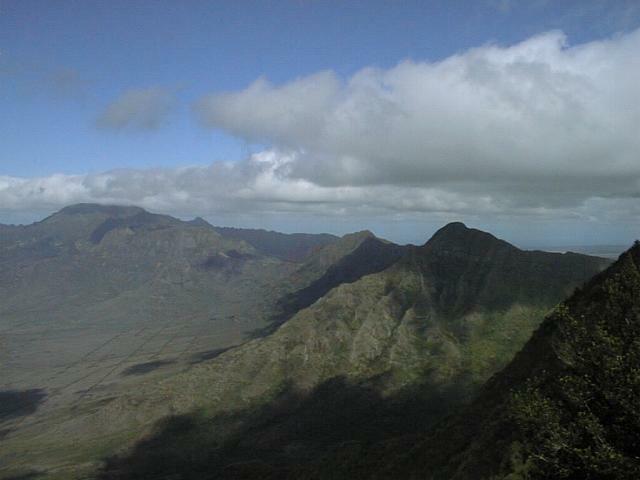 It is the 5th highest peak on Oahu. We met at the Makakilo Community park at about 8:30am, talked a bit and then headed for the trail. The started our trek through a small bamboo forest and then almost immediately broke out onto the ridge line! The first views were of Nanakuli valley with their circle-shaped school buildings. We followed the ridge towards Palikea, walking through alternating areas of native and exotic flora. There's a cool rock tunnel that we passed through just before coming out on a small open plateau. 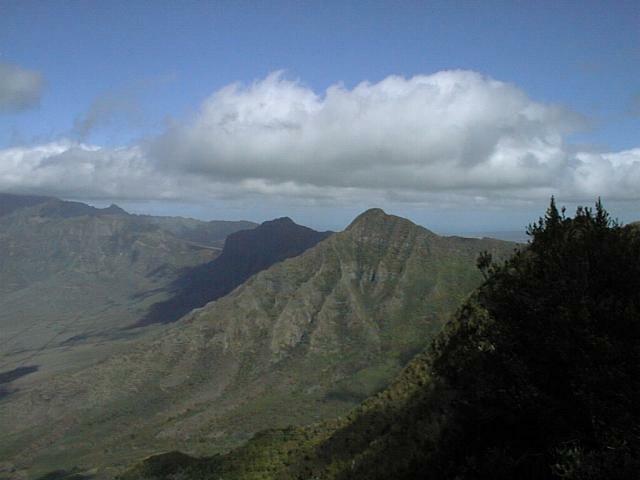 From this nob there are superb views of Nanakuli on the left and Kunia on the right with the Koolau range in the distance. We continued on through an area where native trees are being reintroduced by The Nature Conservancy. Soon after, we negotiated a windy graded section with a drop off down a rocky valley. The trail was a bit eroded after this and led to a few areas of potential danger that had not been that way in the past. The last climb is just about the only steep part on the entire hike and before we knew it we were popping up on a beautiful peak just in front of Palikea. A 360 degree view made this a great place to stop and take pictures and it just so happens to be the end of the trail so we sat down to grind our lunch! Notes: Because the hike starts so high, there is very little elevation gain. Although not rigorous, there are a couple sections with somewhat steep dropoffs but nothing really life threatning. Even though it may be raining in town, the Waianae's are a lot drier and thus it seldom gets very muddy. Of special note is that this trail is within the Honouliuli Preserve and thus maintained by The Nature Conservancy. Reservations are made through TNCH office by calling 808-537-4508 ext. 220. A $5.00 deposit is required and space is limited. 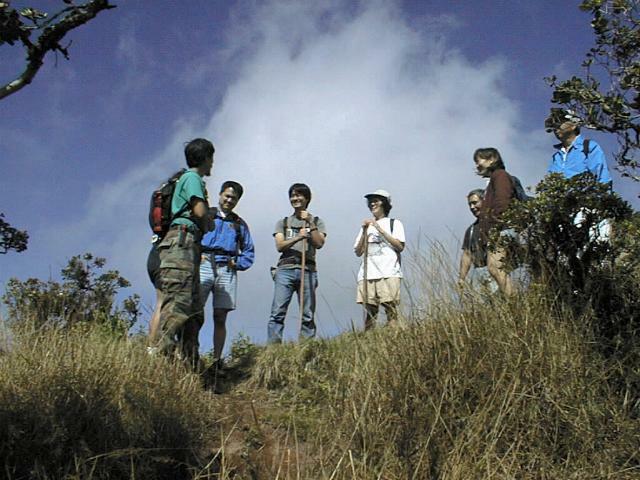 It's really a nice hike and you get to see and learn about the native plants, some Hawaiian history, legends and maybe even see a native bird or snail!